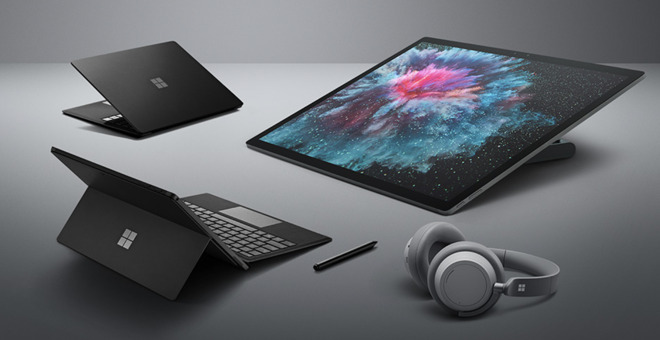 Yet the Surface lineup includes so many various experiments-- Microsoft seems almost unable to say no-- that the cost of developing and maintaining all those SKUs is significant, crushing any hope of profitability. That makes Surface a profit sink, a distraction away from things Microsoft could be doing. It's also worth noting that any significant movement from PCs to ARM processors will come at the cost of fragmentation of the Windows platform. Those expenses will be incurred by software developers trying to target multiple platforms, as well as two sets of chip designers-- Intel and ARM-- spending resources to build the future of Windows PCs. On Apple's side, the differences between Macs and iPads are narrowing, both for developers as Apple prepares to introduce the ability to bring iOS AppKit apps to the Mac, and for chip development as Apple moves more of its proprietary tech to custom T2 silicon and as the Ax architecture nears the point where Apple's own SoCs will have the ability to power Macs. To me the biggest joke is Android and Chrome. We all know Android is dead on tablets. Chrome is a pretend desktop OS which comes not only with its own limitations but also with the fact that nobody is bringing heavyweight software to it (like Photoshop or similar). In order to bolster Chrome, Google has made the odd choice of allowing Android Apps to run on it. So taking inferior Apps written by developers too lazy to optimize for tablets and bringing them over to Chrome is supposedly a good thing? Developers already can’t be bothered to optimize their Apps for large screened devices, and they’re expected to suddenly do a 180 and optimize for Chromebooks? While that is true, Eric, those Chrome laptops are destroying Apple’s role in the class room. Not only are they cheap, but it it is an integrated, easy to maintain wholistic system of software and services. It’s depressingly Sad how easy it has been for google. While that is true, Eric, those Chrome laptops are destroying Apple’s role in the class room. Not only are they cheap, but it it is an integrated, easy to maintain wholistic system of software and services. It’s depressingly easy it has been for google. That and Apple's obsession with the iPad in the classroom, whilst shunning the Mac and Xserve hasn't helped. Also, this article is a bit too much a sit on your laurels type of article. The real question is, how much money has Apple left on the table, how many sales has it not made, by: not adding the to iOS proper file management and peripheral support for the iPad; how many sales has Apple not made because upgrades of memory and storage are too high; how many iPhone sales has Apple not made by not having a small size, up to date iphone? You could go on of course. Its the sales you don’t make, the market gaps you leave to competitors, that matter. Apple of todays does remind me of Apple in the early nineties. And Jobs is no longer alive to rescue her. 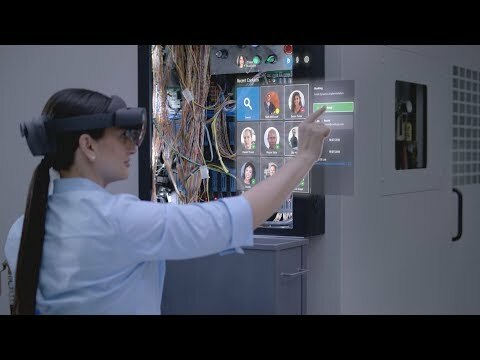 So Hololens 2 and Azure aren't moving beyond? 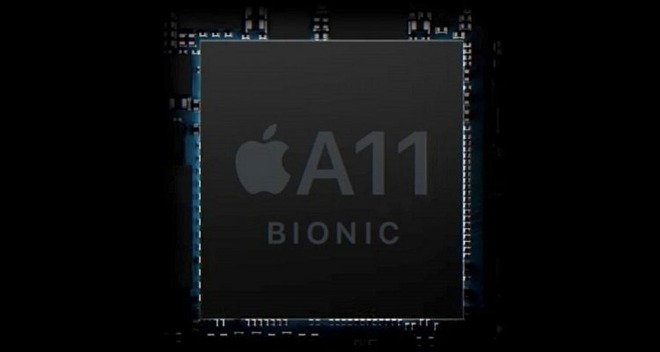 They're utilizing an ARM processor along with their own in-house silicon and hardware to create a product without rival. 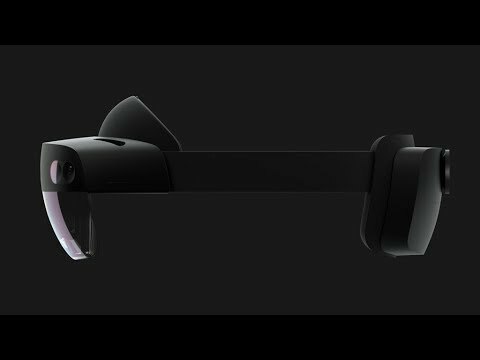 Voice control, eye tracking and hand tracking combined with Azure remote rendering to allow for some very forward thinking experiences and visuals well beyond what the headset's hardware alone could produce. They're building major cornerstones in the mixed reality ecosystem starting with commercial and enterprise applications. They're partnered with dozens of industry leaders and scoring major contracts, such as the roughly $500 million dollar contract with the US military. Xserve was simply not a viable business. One of the consultants at my work relies on his Chromebook for everything he does at work, which is email, word processing and spreadsheets. He likes it because it's all integrated, all on the cloud and syncs to his Android phone. For people like him, that's all they need and an iPad or MacBook would be too expensive but for a $250 laptop, it's perfect. This is a very interesting point. You've described a couple things: 1) a particular use case/user pattern that's probably very common, 2) an all-in-one, seamless, integrated solution that makes it easier for the user, and 3) a great price. This is pretty compelling. Apple can do all of this, but currently Apple's counter-offer to something like Google docs is...well...it looks pretty but it's just not pervasive enough to compel tons of people to use it. They could get there, but they're not there yet. - HomePod: total desaster, stereo mode got lost again an again, Siri not able to find the most common radio stations, and sound quality far behind e.g. the B&W Zeppelin. - Beats: cushions of the headphones crumbling to dust, and really just after ocxational use. For me the simple summary: though the company is still making billions, the shareholder value pressure is taking more and mkre its toll and the company is losing its quality angle. Really a shame, as they play with their some differntiator from comlanies like Google, Samsung, Microsoft, etc. It seems absolutely ridiculous to me to lump iPad and PC sales numbers together. The iPad is not a PC and it seems so bizarre to me that some people would came it to be so. What makes an iPad not a PC has nothing to do with the processor. It's the lack of a real file system and peripheral support with actual ports you can plug into that make an iPad not a PC. I have both a PC and an iPad because there are things you can do with a PC that are not practical with an iPad. I have a large number of files on my Personal Computer but basically all I have on my iPad are a collection of Apps. A group of MS employees is demanding they cancel that military contract. Lol...100 employees? Yah, they can go pound sand if they think MS is giving up a $480M contract. Geez, was this a paid blurb, or what? OK, AppleInsider's an Apple fan, but c'mon ... Apple's overall business model, including most of the hardware and sevices they make, seem pretty good, and APPL stock has begun to recover, but this article has it that "the future of PCs" has nothing to do with computers. COMPUTERS (remember? ), not almost-computer-like smart devices. Apples, then Macs, in their various always-better forms and functions, running on a great OS with a revolutionary GUI - not to mention the other great software Apple used to make, then abandoned - used to be the backbone of this company. That's clearly no longer a priority. Maybe it's because Macs never really caught on with the business community, but I can't get over thinking that Apple didn't try hard enough to make it happen. Whatever, Apple's no longer the hardware genius it used to be, and my impression is they're no longer interested. They can still make pretty good stuff, but even there it seems that over the years they're playing catch-up, not leaders. Really capable, easy-to use laptops, with state-of-the-art innards and ports is what I'm talking about, and, for both the professional clientele as well as for showcase purposes, something really unbeatably over-the top - maybe even a (dare I say it) desktop, or even a workstation. But seriously, is a pretty-good Mac with more pixels, Dark Mode, or a TouchBar, or 1 or 2 mm. thinner or 2 grams lighter, or an ever-slimmer bezel, or syncing all my tunes and films to all my devices really that revolutionary - let alone needed? The WOW effect fades quickly. And re-writing the MacOS to use iOS apps???!!! How about re-writing iOS to be as good as MacOS? I used to trust Apple to do these things, and they did. I now only believe Apple could still do these things if they wanted, but I'm beginning to wonder whether my belief isn't misplaced. Apple may have a future in the digital business world, maybe even a bright future, but I'm not sure that will be in the computer business. Just sayin'. Macs are secondary to Apple now, even though though without macs there will be no iOS devices. All their mac products are hobbled and way overpriced. I would love a plastic mac with user replacable ssd, ram, battery and ports, just like the black mac books. They will loads of these. iOS is years away from replacing a mac, if ever. Apple is laser focussed iPhone, services and subscriptions now. Air Pods and Apple watch is good though. In this second of a two part series (for part 1, see http://appleinsider.com/articles/19/02/23/apple-in-2019-surviving-iphone-challenges-like-the-1990s-microsoft ), DED focuses on so-called "PC's". That's Personal Computer, to you and I, or computers that individual consumers can find useful. In the comments section, we see at least a couple that protest linking iPads with "PC'S". Slow N Easy's 2nd post here says "What makes an iPad not a PC [is] the lack of a real file system and peripheral support with actual ports you can plug into....". Gbdoc says "... this article has it that "the future of PCs" has nothing to do with computers. COMPUTERS (remember? ), not almost-computer-like smart devices". I don't know who these two think they're trying to kid, but the term "personal computer" has zip to do with anything but the concept of a computer for personal use. It is thus only differentiated from a non-personal computer. Hence ANY personal computing device, including "pocket computers" like smartphones or wearables like the Apple Watch, is, by definition a "PC". Still, what they're striving to get to is that, in the classic world of the past, a "PC" was essentially a personal desktop computer, as opposed to a VAX or some other distributed yet centralized computer system, typically employed by large businesses. To say that that definition of "PC" no longer applies is an understatement, albeit some "wiggle room" is still given it, by Windoze supporters and such, by calling computers that can be folded up and carried about "portable computers" (hence "PC's"). This allows them to assert that the Microsoft Surface is in fact a PC while the iPad isn't. How convenient! And how utterly laughable. OF COURSE the iPad is a "PC". Doesn't matter if it can't run all Microsoft's software, even in emulation mode. The iPad is no more different from the old desktop PC's than a "portable computer" is. It reminds me of when they used to say an iPad wasn't a PC because it didn't have a separate keyboard and mouse. Well, with the proper software, it doesn't need a mouse, and even if some particular software required them, it would be simplicity itself to attach a mouse or a trackpad/trackball via bluetooth. 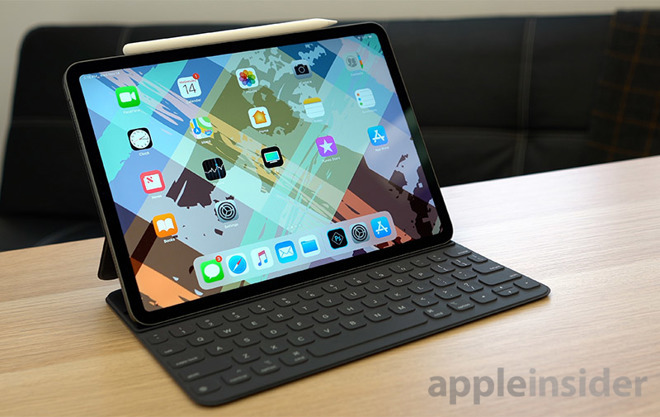 And if a virtual keyboard wasn't good enough for you, iPads now have perfectly good physical keyboards they can connect to. So why on earth would people be so insistent on saying the iPad isn't a "PC"? DED has made that abundantly clear; "IDC, Gartner and other firms have valiantly tried to minimize Apple's real position in the PC industry." Why? 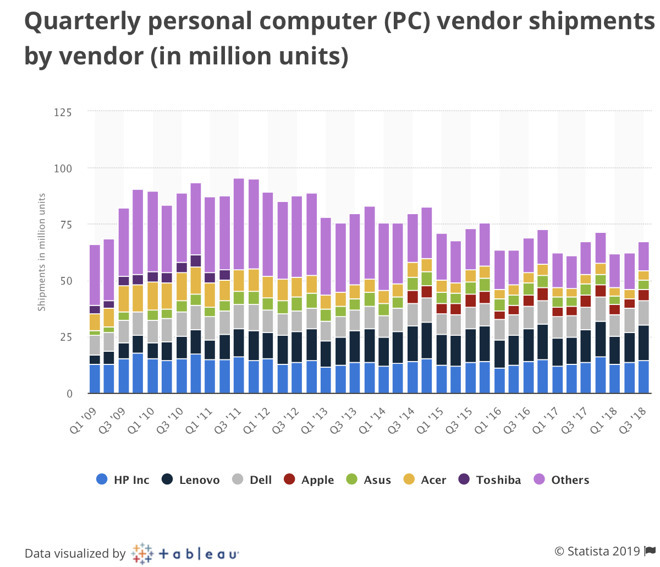 AS DED also said, "Over the past four quarters, Apple sold 61.74 million iPads and Macs, making it the leader in PC unit shipments, ahead of second-place HP's 57.16 million PCs shipped". IOW, if these people didn't try to minimize it, then they'd have to acknowledge that Apple is literally the number 1 producer of PC's in the world. And we can't have that, now can we? Several other posters here have also talked at length about areas where Apple is not doing all, in their opinions, that it can. But that's looking at the individual trees, and ignoring the forest. No company, not even Apple, is going to be all things to all folks. And they're going to make their fair share of bonehead moves. I consider their not having been far more conservative in their initial guidance for Q1 '19 to be a classic bonehead move that cost Apple stockholders a ton of value, when Apple had to halt it's December buybacks in the teeth of a major attack on it's valuation. So no, Apple's not perfect. But it's far closer to that goal than any other company presently out there. Bottom line: The Apple forest, as these two DED articles make very clear, is doing quite well, thank you. It's a shame that so many people have been bamboozled into not recognizing that. Discover iCloud, then ports/peripherals & files just vanish. Using both devices is likely to lead you to a compromised mindset & workflows. About the only thing left that separates iPads from being an all in computer is the lack of ability to code and develop. Absolutely. But iOS13 could narrow the gap. Dunno. Seems like a $250 iPad does all that too. OK, maybe you need to add a hard keyboard (like in the smart cover) and that's a few more quid. I have to confess, Apple’s abstinence from groupware is its Achilles heel. They should have started to transition OSX Sever functionality to iCloud upon release and not just for education. Looking at the mess which is O365 & G-Suite’s pushing of 1st-party services there’s still time but it has to be now.